Today officially marks the first day of Spring. And while it certainly doesn’t feel like it yet, spring cleaning time is upon us! Traditionally, spring cleaning is a time to go through your abode and get rid of unnecessary possessions you may have collected over the past years. This year, we thought we’d switch it up a little and offer you some tips on how to clean the part of your life you spend most of your time on: your iPhone! This is the big one. Remember that time you downloaded that fitness app so you could start counting your calories and tracking your workouts? And then got sidetracked and decided to go to the ice cream shop across the street? If you’re not using that app, press for a second and delete! Unused apps take up storage on your phone and add unnecessary clutter to your life. Luckily, Apple provides some easy ways for you to see what apps you’re using and which ones you aren’t. First, go to Settings > General > iPhone Storage. This will show you how much of your physical phone storage is being used by each app (pictured left). It will also tell you the last time you used each app, or if you’ve ever even used it at all. If you haven’t used an app in over 6 months, chances are you probably don’t need it. You also might be surprised at how much storage the apps that you rarely even look at are using. For example, the Podcasts app might be auto-downloading new episodes, taking up [many] gigabytes of space on your phone. If you don’t ever listen to podcasts, this is a tremendous waste. All that excess information adds up and can really slow down your iPhone. Additionally, you can also go to Settings > Cellular to find out how much data per month you are using in each app. This will give you a clearer picture of what you’re actually using your iPhone for. Be mentally prepared when you see how much data you spend on social media; it might make you seriously reconsider the time you spend on editing the perfect Instagram photo. Calling all accidental screenshots, selfie bursts and miscellaneous photos from who-knows-how-many-years-back. Going through and deleting them will save you a lot of storage (especially the videos!) and make it much easier for you to find the pictures you actually want to keep. 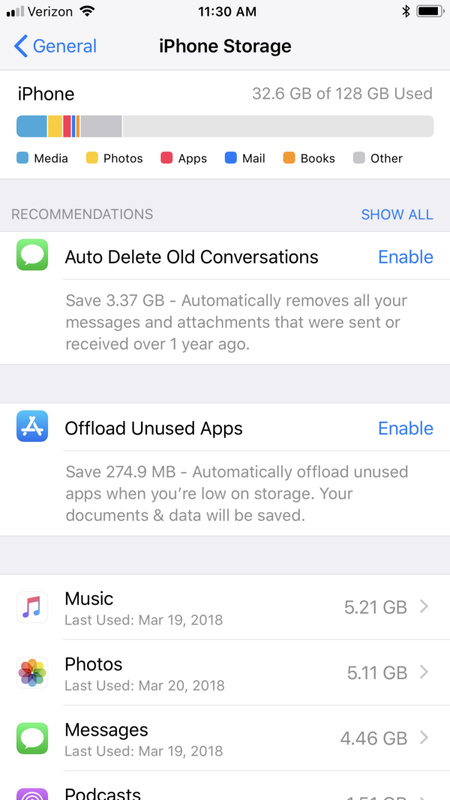 Just as you went to Settings > General > iPhone Storage to get rid of the applications you don’t need, you can use the same feature to Auto Delete Old Conversations. Enabling this will delete any texts and attachments that were sent through the Messages app over one year ago. If you want to keep fond memories (or blackmail), you can also manually browse through old text conversations and delete the ones you don’t need anymore. Your iPhone’s internal storage will thank you. Emails. Can’t live with ‘em, can’t live without ‘em, right? What you can do though is stop receiving emails that you actually don’t need. Check out unroll.me, a service that goes through your inbox to detect mailing lists you’re subscribed to, and allows you to unsubscribe immediately. Saves phone storage and [some] Monday morning headaches. In 2018, cellphone addiction is an extremely legitimate thing, a horrifying one in some cases. Do you really need to know what your aunt recently posted on Facebook? Or that someone liked your Instagram photo the moment it happens? Okay, maybe you do. But for the majority of people, it’s just unnecessary. Silencing notifications will make your phone look cleaner, operate more smoothly, and provide significantly less distractions. After all, you spent so much time picking out that beautiful lock screen image. Don’t you want to see it when you open your phone? All in all, depending on how much excess stuff you had on your iPhone prior to your spring cleaning, it may or may not look all that different. What you do now have though is a much more functional phone . On top of that, you may have found that the most valuable thing you got from this exercise is that it forced you to consider what you’re dedicating your time to. When you see that you’ve already used over 100 GIGABYTES of data on social media this month, it may make you realize that you should allocate your time differently. Maybe spring cleaning your iPhone enabled you to declutter your real life after all.